When it comes to your target audience as a retail store, you need to understand your buyer and how they make their buying decision in order to ensure your marketing is effective. The buying decision involves attracting the attention of the buyer, convincing them of their need and completing the sale. Some of the most influential people …or should we say mini people…. Are children. When you have a child’s attention and they want something, they let their parents know. The “pester power” factor has a huge impact on sales. Consider some of the “must have” toys from the past, Buzz Lightyear, Furby and Playstation, as soon as they gain popularity, they become more and more in demand, and retailers cannot get enough stock fast enough! 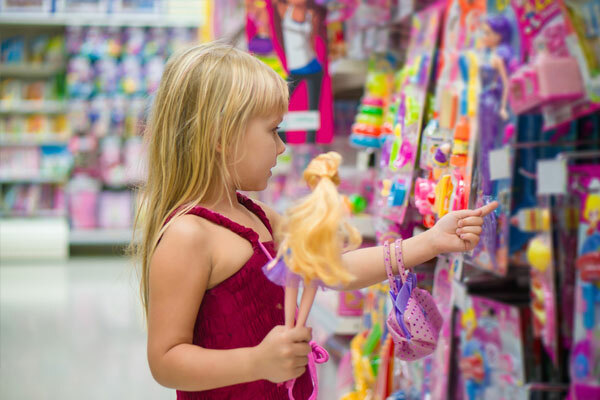 As a retailer selling products to appeal to children, your marketing needs to appeal to children and their parents. AGRetail are the experts in retail marketing, with numerous years’ experience in marketing solutions for retailers. If you are a toy store, children’s clothing store or chlildren’s book store, AGRetail are here to help. Thinking of shops selling products for newborn and young babies, you will often find heavy use of pastel shades, pink, blue and grey, and for shops for toys and more fun products, you will tend to see more primary colors – red, blue and green. Highly effective, these color schemes help associate the mind with nurture and care for the newborns and development and fun for the growing child. If you are looking for retail barricades, if you are opening a new store or rebranding, choosing these combinations of colors will ensure you attract the right audience. AGRetail produce bold, clear and professional retail graphics that will withstand high traffic and remain in perfect condition. To attract children and their parents, window graphics, point of purchase displays and exciting store fronts, produced to a high standard by AGRetail will position your retail store ahead of your competitors. Why not call AGRetail today?